8 lucky finalists from across the United Kingdom put up a hot battle at the final of the United Kingdom South Asian Chef Competition (SACC) 2013. The competition was staged at the International Food & Travel Studio (part of the Bradford College family) with its state of the art facilities. With an ever increasing high standard of entries, it was very difficult for the judges to arrive at their final decision. The competitor’s skills were measured by a panel of influential chef judges representing the Craft Guild of Chefs, the Catering Industry and Education. Chair of Judges Andrew Green, supported by Stephen Gomes and Richard Jones who will have had the very challenging responsibility in defining the winners at the final yesterday. The lucky winners were awarded their trophies at the glittering Aagrah’s 31st Annual Charity Business Dinner, hosted by TV Personality and Broadcaster Gyles Brandreth to a distinguished business audience of 450 guests in the magnificent Aagrah Midpoint Suite. The first prize Awarded to The Executive Chef and Chef Patron of The King and Thai Restaurant at the Forester Arms Broseley, Shropshire. Self taught Suree was commended for her professional approach in the kitchen, cleanliness and creative dishes with presentation flair, flavour and innovations. On collecting her award Chef Suree commented “I am delighted to have firstly reached the finals of this prestigious award, and to have the opportunity to compete with such accredited fellow chefs, but to have actually won it against such high calibre fellow competitors on my first year is beyond my imagination. I would like to thank the judges for their kind comments, as well as teh support of our regualr customers at The King and Thai in broseley, who have all been very supportive.” chef Suree will be hosting a special dinner on Noverber 25th to thank her customers for their support and will be cooking the four dishes she created for guests. 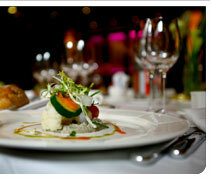 The high-profile SACC awards recognise outstanding achievement in all areas of culinary skills. It also helps to raise the profile of the chefs and restaurants participating, and brings highly skilled chefs and the establishments they represent to the attention of UK’s general public in addition to the leading businesses attending the awards ceremony. Date: Monday November 25th from 7pm. Seated 7.30pm. King prawn Citron Salad starter. Seabass with mussels. Each savoury dish matched with a wine flight taster. To finish...an assiette of desserts to share. £45 per person incl wines & Wenlock table water.